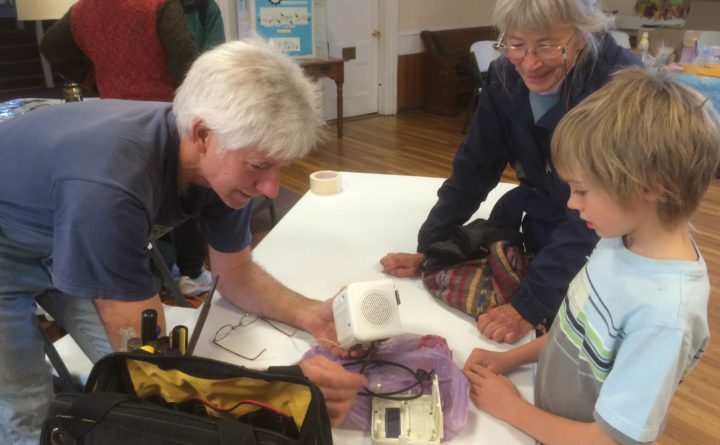 Jim Merkel, left, of Belfast, looks at some small electrical items that were brought in to a Repair Cafe, organized by Belfast Community Works. In many people’s houses, there is a collection of objects that live in limbo: broken toasters, coats with nonfunctional zippers, a lamp that just won’t work right anymore. Often, the ultimate destination for these once-useful, now-tired belongings is the local landfill. After all, who has the time to fix them? Who even knows how to fix things like that anymore? But two Waldo County women have started Belfast Community Works, a new nonprofit “maker” organization, with the goal of changing that pattern by teaching people how to repair and build things. The national maker movement, which began in the mid-2000s, has been described as a technology-influenced do-it-yourself community. It’s a natural home for people who want to learn skills both old, such as sewing, baking and carpentry, and new, such as electronic repair and coding. They’re not there yet, but enthusiasm and awareness of what they want to do is growing. “We have started trying to build a membership of supporters at this point, and of energy and enthusiasm,” Jasmine Fowler of Morrill said. They dream of one day opening a dedicated makerspace, similar to (though smaller than) Portland’s Open Bench Project, a 7,500 square foot facility that provides members access to studio/work space, tools and resources. But until that happens, Kutsy and Fowler have been organizing special events to bring together people who have, and are willing to share, different skills with those who want to learn them. This coming Sunday, there will be a Repair Cafe, held from 11 a.m. to 2 p.m. at the Belfast Free Library’s Abbott Room. This cafe will focus on fabric and electrical fixes, and attendees are encouraged to bring holey socks to learn how to darn them, jeans and shirts that need knee and elbow patches and small electrical appliances in need of repair. “Our team of tinkerers will work with you to get it fixed,” they wrote on the online description of the event. One of those tinkerers is Fowler’s 14-year-old son, Wylie Fowler, who has had an abiding love of electronics all his life. He remembers being occupied for hours when he was little if he was plunked in front of a VCR, though not to watch movies. He just liked to put the VHS tapes into the machine and then eject them, over and over again. As he grew older, the homeschooled youth taught himself more about building and fixing electronics primarily through watching how-to videos on YouTube. But through Belfast Community Works, he has met a local retiree named Charlie Crane who shares his interests in engineering and tinkering with electronics. “Charlie’s been my first real mentor, and he’s been a real help on the engineering side of things,” Wylie Fowler said. During the last couple of repair events, Crane and Wylie Fowler brought their tools and were able to help people fix things including lights, lamps and a toaster, although they were stymied by the broken microwave that someone brought in. But stubborn microwaves notwithstanding, the spirit of the events, and of new connections made such as the one between Wylie Fowler and Charlie Crane, has been exactly what Kutsy and Jasmine Fowler were hoping for. Last spring, at a garden-themed event, around 30 people turned out to learn different garden-related skills and to do things including tune up their chainsaws. At an event earlier this winter, people learned how to make their own reusable shopping bags, useful in Belfast, which banned single-use plastic bags o n Jan. 1. Kutsy said she’s looking forward to this Sunday’s gathering, with its focus on fabric. They have always found people willing to help out, they said.